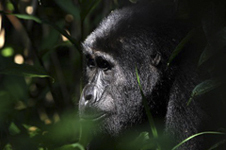 Uganda Gorilla Trekking Adventure; 4-Day Gorilla Tracking Package. Group size: Guaranteed from 2 guests. *Guaranteed departures with no minimum pax available, please enquire. Departures: Daily, subject to availability. Please enquire. 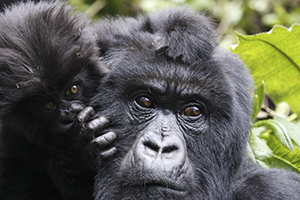 A 4-Day Gorilla Trekking Package. Lake Mburo National Park, Boat ride at Lake Mburo, Bwindi Impenetrable Forest National Park, Gorilla Trekking. 01-Jan to 31-Mar / 01-Jun to 31-Oct / 01-31 Dec: $2,220 per person sharing, plus Park Fees of $620. 01-Apr to 31-May / 01-30 Nov: $2,105 per person sharing, plus Park Fees of $465. You will be met and collected from Entebbe and driven south westwards to Lake Mburo National Park (the drive will be approximately 5-6 hours), the only park in the country with an entire lake from which it derives its name. In the afternoon enjoy a boat ride, viewing a diversity of animal and plant species: crocodiles, hippos and birds including pelicans, Black Crake and heron. Overnight: Mantana Tented Camp or similar. Meals: Dinner at Mantana Tented Camp or similar. After an early morning game drive we depart for Bwindi Impenetrable Forest National Park (the drive will be approximately 6-7 hours). The park derives its name from its thick vegetation with an immense variety of evergreen trees, festooned with lianas, epiphytes, which reach great heights in their search for sunlight and is known to host half of the world’s population of mountain gorillas. Overnight: Mahogany Lodge or similar. Meals: Breakfast: At Mantana Tented Camp; Lunch pack from Mantana Tented Camp; Dinner: At Mahogany Lodge. After an early breakfast, you will be taken to the Park Headquarters for a short briefing after which you will enter the forest and start your Gorilla trek (please note that a drive may be required to your trekking starting point). Trekking can be anything from 2 hours to as long as 8 hours, if not longer depending on where the Gorillas are situated on the day. Meals: Breakfast: At Mahogany Lodge; Lunch pack from Mahogany Lodge; Dinner: At Mahogany Lodge. After breakfast, we depart Bwindi and head back to Entebbe, arriving in the evening (this is a long drive of approximately 9-10 hours so we do recommend a flight from Kihihi to Entebbe at an additional cost of approximately USD 290 per person). Meals: Breakfast: At Mahogany Lodge; Lunch pack from Mahogany Lodge. You will spend 3 nights in lodges and/or permanent tented camps as per the itinerary, all with en-suite bathrooms, all transport in a fully equipped safari vehicle, 1 Gorilla permit per person, game drives and activities as per itinerary, meals as mentioned in the itinerary, park entrance fees, experienced & registered local guide. Flights and airport taxes, travel insurance, health requirements, pre and post tour accommodation, all drinks, tips, visa fees, telephone calls, curios & items of a personal nature. Fully equipped customized Toyota Landcruiser vehicles with comfortable seating; windows for game viewing and a music system. 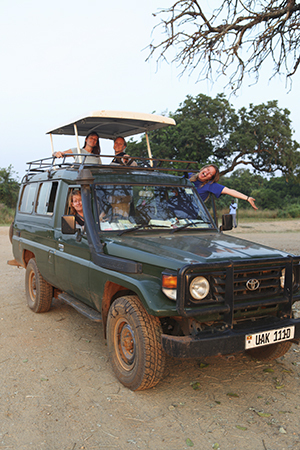 The vehicles are equipped with pop-up roofs to facilitate the best game viewing. For this accommodated safari, we make use of mid-range lodge accommodation. Your accommodation is situated either in National Parks, on the banks of a river, or in other places of interest. The accommodation will be a mix of lodges, chalets and permanent tented chalets with en-suite facilities. Some properties are equipped with swimming pools and/or bar areas. Clients are advised to bring enough money to cover the purchase of curios, tips for the guide and additional entertainment. US Dollars and Ugandan Shilling are the most practical and convenient currencies. Our guides are trained in basic first aid. Preventative Malaria medication should be taken before the trip and throughout its duration and it is advisable to consult a doctor prior to departure. Yellow Fever vaccinations are compulsory – please contact your Travel Clinic before departure. The onus is on the client to organize all visas required to visit Uganda, prior to departure. When pioneer tourist Winston Churchill set foot in Uganda in 1902, he was so overwhelmed by the beauty of the country he called it the 'Pearl of Africa'. He was right. This where the East African savannah meets the West African jungle. Where else but in this uniquely lush destination can one observe lions prowling the open plains in the morning and track chimpanzees through the rainforest undergrowth the same afternoon, then the next day navigate tropical channels teeming with hippos and crocodiles before setting off into the misty mountains to visit the majestic mountain gorillas? Bwindi National Park (331 sq km), christened the Impenetrable Forest, is home to half of the world's known mountain gorillas, about 330 of them – there's just one Bwindi gorilla for every 20 million people! Penetrating the Impenetrable Forest is no picnic, as the terrain is steep and the foliage unforgiving, but what a reward. All the hardships are forgotten in an instant with the first glimpse of the gorillas in their mountain kingdom. No bars, no cars – this is not a safari park but their world, and you become their privileged guests. Bwindi Impenetrable National Park is situated in south western Uganda, on the edge of the Western Rift Valley (Albertine rift) and is shared by Kanungu, Kabale and Kisoro districts. 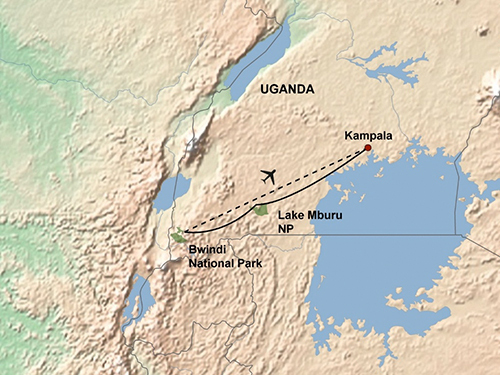 It is 331 sq km in size and on an altitude range of 1,160 meters (Ishasha Gorge) to 2,607 metres (Rwamanyonyi Peak). The annual average temperature range is 7°C - 20°C with the coldest period being June and July. 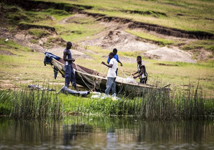 Of the local people neighboring the park, the majority are Bakiga and Bafumbira, constituting the densest settlements in Uganda (350 people/sq km). A few Batwa are also found. Species Diversity: Bwindi is home to 326 gorillas, almost a half of the world's population of mountain gorillas. There are also 346 species of birds and over 200 species of butterflies. This afromontane forest has dense under storey of fern, vines and shrubs. About 324 tree species have been recorded here, 10 of which occur nowhere else in Uganda. This is the major activity in Bwindi, with four gorilla groups currently available daily for tourists. Mubare group (10 gorillas, 1 silverback) was opened for tourism in 1993, Habinyanja group (18 gorillas, 1 silverback) opened in July 1998, Rushegura group (10 gorillas, 1 silverback) was opened in July 2002, while Nkuringo group (19 gorillas, 2 silverbacks) was opened for tourism in April 2004. 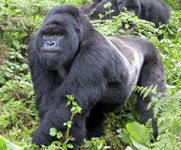 Gorilla tracking in Bwindi can be challenging, therefore ensure fitness. The tracking experience starts at 8.30 am local time and can last from a few hours to a whole day! Registration at the gate commences at 7.45 am. • Wear jungle shoes suitable for steep muddy slopes and carry a rain jacket because the park is often wet. • Carry rain gear, sunscreen lotion, a hat (as the weather is unpredictable) and insect repellant. • Carry a packed lunch. • No one with a communicable disease (e.g. flu, diarrhea) is allowed to enter the park. • Stay together in a tight group while with the gorillas, don't surround them. • Don't get closer than 7 metres (21 feet) to the gorillas. 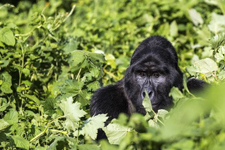 • Don't eat or smoke when with the gorillas or within a distance of 200 metres from the gorillas. • Burry all human feaces a minimum of one foot deep and ensure that the hole is properly covered. • Don't leave litter. All litter must be carried out of the park and disposed off properly. • Don't spit on vegetation or soil when in the park; use your hankie or other garment. • Your group must not be more than 8 tourists and must all be over 15 years old.